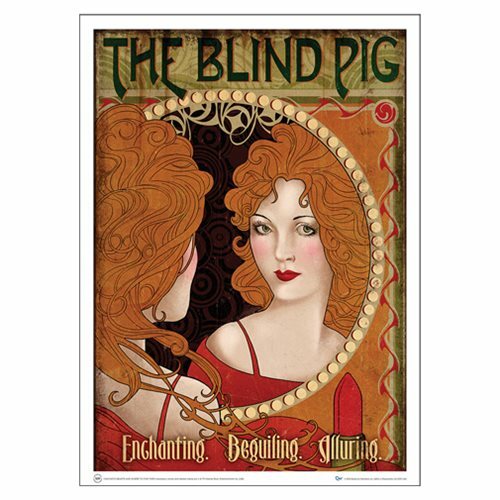 From the 2016 fantasy adventure Fantastic Beasts and Where to Find Them comes the top-notch and first-rate Fantastic Beasts and Where to Find Them Blind Pig Art Print! We are proud to bring you this design as a museum-quality art print on 100 lb. aqueous-coated, satin-finish paper. This colorful print shows the establishment known as the Blind Pig, where the wizarding underworld gathers in New York City. Fantastic Beasts and Where to Find Them is a 2016 fantasy adventure that returns us to the wizarding world created by J.K. Rowling. The movie opens in 1926 - 70 years before Harry Potter attended Hogwarts School of Witchcraft and Wizardry. Newt Scamander has just completed a global excursion to find and document an extraordinary array of magical creatures. He is in New York for a brief stopover, but is waylaid by a no-maj (American for muggle) named Jacob, a misplaced magical case and the escape of some of Newt's fantastic beasts. 18-inches wide x 24-inches high.